A Wine Tourist’s Guide: Visiting Tasting Rooms by Terry and Kathy Sullivan cuts the intimidation factor from the world of wine. After arriving at a winery tasting room, what will visitors see and experience? This quick guide will help newcomers to the world of wine and those more experienced wine enthusiasts. 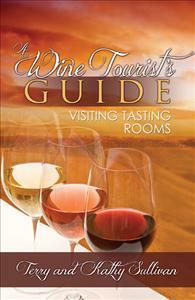 A Wine Tourist’s Guide covers tasting room expectations, etiquette, wine tasting, and wine aroma charts. Also included are some common wine myths and misconceptions. Readers will find a suggested wine tasting form, a discussion of common grape varieties, and suggestions on how to plan a trip to wineries.